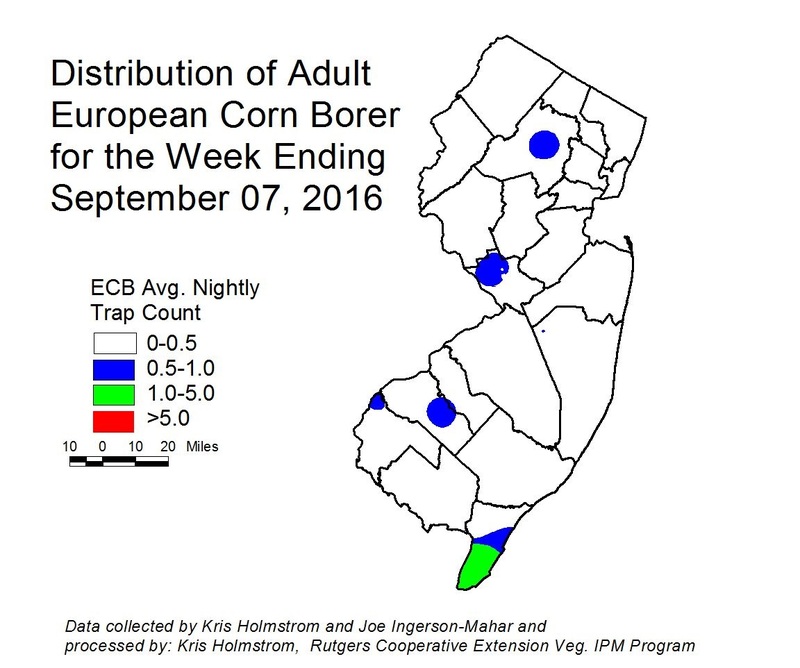 Low numbers of European corn borer (ECB) adults continue to be captured this past week. At the present time, highest activity remains in the Cape May-Cumberland County border area (see ECB map). Earlier ECB catches were extremely low, and these moths, likely representing a partial third flight, will not present much of a threat to host crops. This is particularly true in light of the dominance this year of fall armyworm (FAW). FAW will probably remain the larger threat, and treatments for this pest will eliminate ECB in the process. 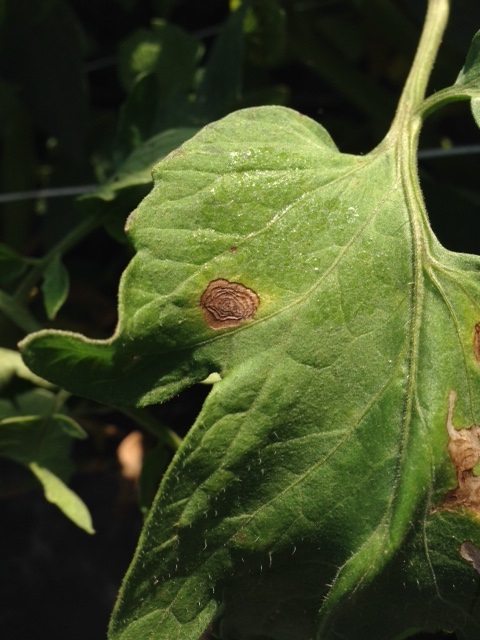 As always, consider treating when the number of infested plants in a 50 plant sample exceeds 12%. Any planting remaining at or above threshold as it proceeds to full tassel should be treated, as this is the last stage at which ECB larvae will be exposed and vulnerable to insecticidal sprays. See the 2016 Commercial Vegetable Recommendations Guide for insecticide choices. 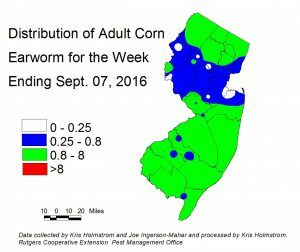 There has been no change in the fall armyworm (FAW) situation. Infestations continue throughout NJ, with high infestation rates in all parts of the state. This pest is devastating to small corn plants, and in fact the worst infestations are currently in shorter whorl stage plantings. Fields down to seedling stage should be scouted weekly for signs of infestation. We should expect this pest to be with us for the remainder of the sweet corn growing season. Treat when FAW alone or in combination with ECB damage exceeds 12% plants infested. FAW do not respond well to pyrethroid insecticides. The most useful products are those in the IRAC group 28 class (Coragen, Exirel) or the IRAC group 5 class (Radiant, Entrust), or combination products including these classes. See the 2016 Commercial Vegetable Recommendations Guide for insecticides effective against FAW. There has been a slight uptick in corn earworm moth (CEW) activity in the northern counties over the past week (see CEW map). Elsewhere, the situation is unchanged. Despite the forecast, NJ did not receive much moisture from the recent tropical storm. As such, the increase in CEW we might have expected did not occur. However, weekly averages remain moderately high. Many North Carolina traps are now registering declining catches, while Delaware’s network is showing catches similar to ours. It is advisable to incorporate materials into the spray program that have different modes of action from the pyrethroids. This includes IRAC 28 materials like Coragen, Exirel and Besiege, as well as IRAC 5 (Radiant, Entrust (OMRI approved), and Blackhawk)). Our current population is still lower than we traditionally get in mid-August. Growers should be checking CEW activity frequently, and adjust spray schedules according to local activity. The limited CEW pheromone trap network in the southern counties registered stable catches over the past week. 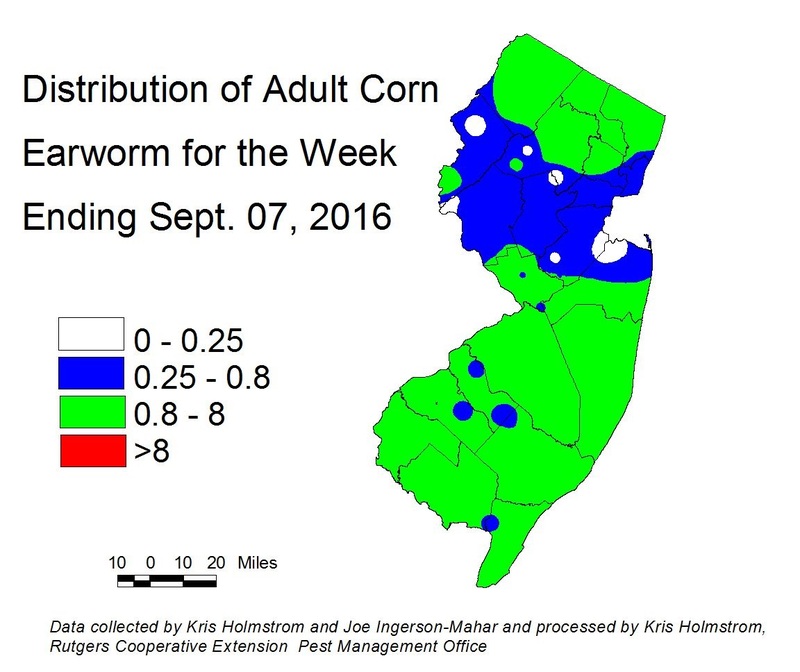 Significant CEW moth populations are present throughout southern NJ (see CEW pheromone map). The low number of traps results in broad areas of color within the map. It is critical that growers monitor local CEW moth numbers. At present, this population constitutes a significant threat to silking corn. For silking sweet corn, the following spray schedules are warranted. *These recommendations are based on regional catches. 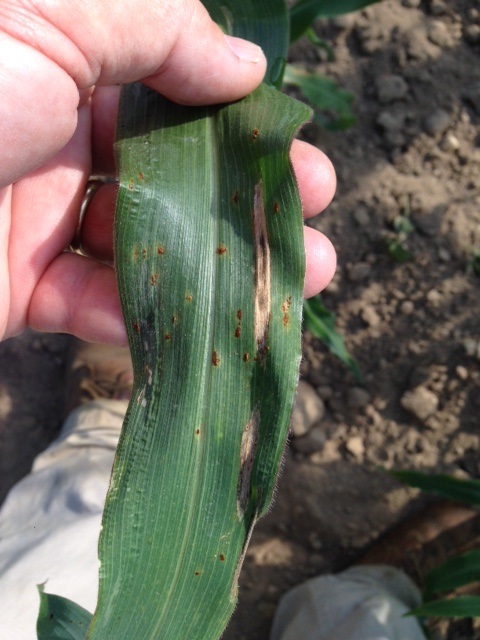 Corn leaf rust and northern corn leaf blight (NCLB) are now present in many late plantings. 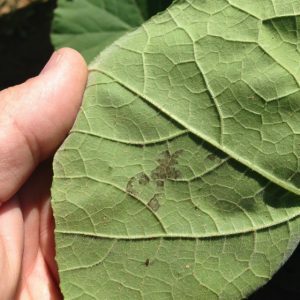 Both of these diseases are favored by leaf wetness, which increases with longer nights. Rust causes reddish, powder (spore) filled pustules to erupt from the leaf surface, while NCLB causes elongated tan lesions (both may be seen on one leaf in photo at right). Both diseases can reduce the amount of productive leaf surface, which can result in shorter ears to be produced. At less destructive levels, both can still cause unsightly lesions on the husks. The 2016 Commercial Vegetable Recommendations Guide lists several fungicides for these diseases. Be sure to observe pre-harvest intervals, as some are quite long. 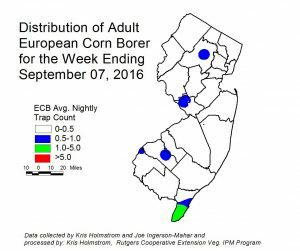 BMSB numbers continued to fall in NJ blacklight traps this past week, and no map will appear in this weed’s edition. This is the time of the summer when BMSB catches in light traps generally decline, while increasing in pheromone traps as the bugs begin to aggregate. It is still important that host crops like peppers be scouted regularly for the presence of BMSB and other stinkbugs at this time. It is often most productive to walk slowly down pepper rows, scanning plants ahead. BMSB and other stink bugs tend to bask near the tops of plants, especially in the morning hours. Down y mildew (DM) is present on cucumbers in all parts of NJ (see photo at left). All growers should be applying appropriate protectant fungicides plus DM specific materials to cucumbers and cantaloupes at this time, and scouting frequently and preparing to make DM applications on pumpkins and winter squash. As of 9/7/16, RCE personnel have still not been able to confirm DM on crops other than cucumber, and the only crop in the DM sentinel plot at Snyder Research Farm in Hunterdon county that is infected is cucumber. DM lesions appear as yellow areas on the upper leaf surface with leaf veins making distinct borders to the lesions. On the lower leaf surface, beneath the lesions, dark spores may be seen if conditions are moist (see photo at right). For more information on the regional presence of DM as well as comprehensive, weekly forecasts, see the following website: http://cdm.ipmpipe.org. At this time, with the current weather pattern, NJ is at low risk of new infections according to the Cucurbit Downy Mildew Forecast. At this time, it is important to check fields for the presence of melon aphid (see photo at left). This pest is capable of producing sticky droppings that can accumulate on the surface of fruit. This condition is unsightly, especially in u-pick situations. Melon aphid is somewhat difficult to control, and applications of synthetic pyrethroids will make the situation worse. 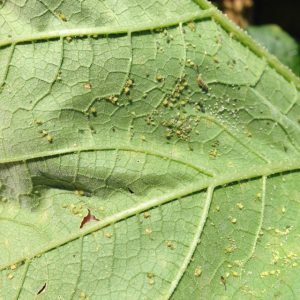 Consider treating if melon aphid colonies are found in more than one site in ten. Newer materials such as Fulfill, Sivanto and Movento are more useful. See the 2016 Commercial Vegetable Production Recommendations for more options. Two-spotted spsider mite (TSSM) continues to be found in scouted fields. This pest is particularly favored by the heat we continue to experience. 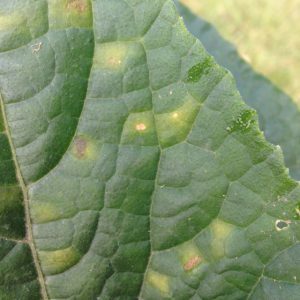 Check fields regularly for the appearance of yellowing on leaves, or whitish pin-spots. Both are indications that TSSM may be present. 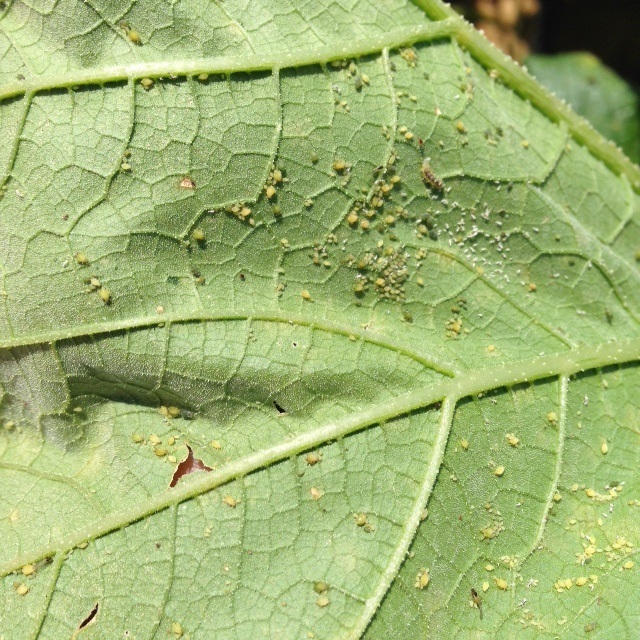 If TSSM is present, the actual mites will be found on the lower leaf surface. It is best to treat for TSSM before the population gets too widespread. Spot treatments may be adequate to achieve satisfactory control. There are a number of good miticides available, and growers should choose products based on efficacy and pre-harvest interval. See the 2016 Commercial Vegetable Recommendations Guide for miticides effective against TSSM. Recently, tomato pinworm was found in the Princeton area. 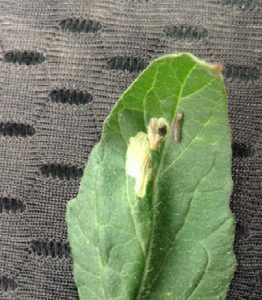 This pest initially causes mines on leaves (see photo at left), and as the larva (a caterpillar) outgrows the leaf, it tunnels into fruit beneath the calyx. Pinworm had begun to appear with some regularity three seasons ago, following mild winters. The harsh winters of the intervening years seemed to stop it. However, the presence of this pest, following another mild winter is an indication that we need to be vigilant for its’ reappearance next year. Pinworm can be managed effectively with several materials, including Coragen, either as a foliar application or through the drip system. See the 2016 Commercial Vegetable Recommendations Guide for other options. It is critical, however, that this pest be managed when mines are first noticed, rather than when fruit become infested. As nights lengthen, and dews are heavier and longer, early blight (see photo at right) can increase dramatically. Be sure to be on a strict protectant fungicide program to preserve foliage into the later part of the season. Early blight (alternaria) generally attacks mature foliage first, but if not managed, it can move up the plant rapidly. Several fungicides and appropriate rotations are found in the 2016 Commercial Vegetable Recommendations Guide. No weevils have been trapped in the past week. As far as known there are no infested fields.